These months were not like the first. These flew. Socially I was beginning to aculturize myself. I had my third and forth date. I swam more often at the British swimming pools. I and fellow volunteers met an American engineer, who dined us into better health and partied us into better spirits while arguing us back into remembering how the mainstream of Americans thought and life was filled more with doing projects than with searching for projects to do. The garden, library, and milk program continued to func­tion well. The orphanage still held my heart and two days a week in my schedule. But the brunt of my work centered around the school. My philosophy regarding increased involvement by these well-to-do students in their nation’s needs became more sophisticated. In other words, fewer words were spoken this semester but more action was achieved. A few pictures, like the beg­gar at the foot of the building, plus some talk in key circles got the program into motion. The year before a half dozen students made a trip with two of the British teachers to help build wells in Bihar. No wells were actually built. Instead, the group got involved in food distribution and, more importantly, they lived with the hungry, ate as they did, and tried to work under those conditions. This year I wanted to get more kids involved and get them to actually accomplish something. Through a rugby contact I found what I needed. The men in Building Two all had their senses, but were without the use of such things as their leg, or arms, or couldn’t control their urinary cycle. Building One had every­thing the other buildings had, only there the ancient people continued what was called life. The Cheshire Home, and its patients unnerved me. But the four Spanish Catholic nuns prayed, worked and sang through their young lives as if they were cast far the Sound of Music. I was pleasantly surprised at the ease with which I got 30 volunteers for the 10-day work camp. The British chairman on the board for the Cheshire Home was delighted with my idea of supplying labor while the board supplied money for most of the needed projects, the smaller other part of the money I was able to obtain from the Peace Corps. After 10 days at the home we had built a new chicken house, painted and fixed much of the furniture, cleared and seeded some very tough terrain into a large garden, started and failed at establishing a handicraft class for the patients, painted and repaired the servants quarters and water pump, and helped cook meals for everyone. For all but two or three of the group this was the first extended manual labor they had done in their 16 or so years of life. It was also the first time that any had worked for the lowest castes of Indians, rather than the reverse which they were accustomed to. It was the first time they had roughed it. We slept under the stars near the newly developed gar­den and ate mostly rice, tasteless chowpatis, platins and gallons of tea. It was a hard diet for them to adjust to but, I think, it showed them something. They had engaged in a so­cially responsible act and had made it succeed. If the thought of the deed would linger, if the thought would plant a seed, if the seed would sprout into a habit, then this capable class of Indians could start adding richness to a great mass of humanity. It was not all labor among the miserable. During the hot afternoons they found light, pleasant conversations taking place with the sisters adding a beauty to them. Afternoons also sometimes found fooling with their friends, the two Bri­tish teachers, or for those who thought they had energy to burn, jumping their two PCV’s and dousing — excuse me, trying to douse them in the nearby pond. It was hard work, but fun, and they were heroes when they returned to school after their summer vacation. After the work camp I took my last break. 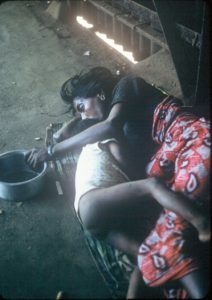 I had been reading about the famine conditions in Bihar, though the lo­cal cinema houses had shown only one documentary on the drought and famine conditions — what was shown all the oth­er times made one feel that India was sprinting into the 20th century amid religious festivities, steel mills and agricultural wonders; now I wanted to see some of those conditions. So I again threw some stuff in my green bag and climbed aboard a third class train out of Bombay. If the monsoon doesn’t come before the middle of June, most of India’s farmers suffer dearly. This was one of the states in worse shape than Bihar, only the government did not want to reveal these plights. Well, I never tried digging in the fields outside of the train’s windows but its parched, brown, barren condition drove the small farmers plight home. After some days, I reached Benares, India’s holy city. Since it was early morning and I was feeling better, I quickly hailed a bicycle-walla and toured the city. The temples, the pagodas, the university, and the Ganges, with its dirty brown, but believed drinkable, holy water, were sights; but by the time the heat of the afternoon arrived they had lost their appeal to me, I left the bike man for the benefits of a small but air conditioned room. I had dinner, took two quarts of beer to my room, wrote in my diary, and slept. The next day I decided on the hill air over that of India’s hot stuff. I trained to Patna, and seeing wells, and green patches along the tracks of Bihar state, I figured that her notoriety was at least making something happen here about the drought. Not much was happening along those miles of tracks through the other three states. From Patna I flew to Katmandu, Nepal where I spent about five days, and then on to the Pokhara valley at the foothills of Annapurna for three days of trekking. I stopped in Delhi where I again met Ambassador Bowle’s wife, who with her husband had visited my chawl work site; and then I returned to Bombay to finish up a few months of work. I wrote a few radio scripts comparing American and Indi­an histories of development, continued checking on the chawl programs, played and coached basketball, went to the orphanage, and taught and coached at Cathedral School. The remaining months flew by and when the end approached I debated about extending. A fellowship at grad school, thoughts of preparing more for a career, and the draft pulled me back and cut my travels home to a month. I still wonder if rushing home was the right path. I know it was a most intense period of my life, I was flooded with new physical, mental, and emotional experiences. I was forcing myself to work on my own, to contemplate, to read, to write and to wonder just what a world of perceived misery, new friends, new acquaintances and new thoughts were doing to me, the person. Still don’t really know what all those vibrations did. Do know, I wouldn’t trade those experiences. You know, when the Peace Corps left town the heart of the heart of the rugby team left with it. But some native heart blossomed at about the same time. The Indian Police team, coached some by John Fuller Sessions and prompted on by the PCVs played the Berahi Shabs of the Rugby Club when we were leaving. For the first time, the Police beat them handily. It looked like it might be a pattern. Competition would be keener from then on. Respect would soon became two-sided, and sweet. Somebody had made those losers believe they could become winners. To me, that’s what building’s about. 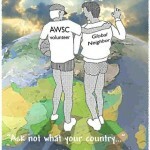 To me, that’s what the Peace Corps was about. I like to believe that many peo­ple from our group planted some seeds, started some projects, laid some foundations that will help those men build their own world, and grow too.